Coffee Taste Testing-Artisanal Chocolate tour+ Much More! ​Welcome to beautiful Ecuador! We will meet in the afternoon at our lodge near the outskirts of Quito. Check in and relax, use the steam room or book a massage, if you would like. We will meet in the afternoon for a welcome drink and a talk about our trip. We will enjoy a talk by a local on Ecuador and Ecuadorian culture. Join us later in the early evening as we head up to the Guapulo neighborhood of Quito and the check out the amazing vantage point of the Volo church. We will stroll along the La Rhonda, the famous walking street of Quito, later in the evening for our first dinner together as we sample delicious Ecuadorian food. * Quito is a little above 9000 ft in altitude. Some people experience altitude sickness and some do not. It is advisable to come a day or two earlier and take it easy before our trip starts. Email us for additional nights at our first hotel. After breakfast at our lodge, we are up early for our trip to Mindo. Known for its cloud forests and butterfly farms it is also known for its flora and fauna diversity. We will have many activities to choose from including a visit to hummingbird garden, tubing on the Mindo river, and a visit to an artisanal chocolate producer. Lunch will be on your own at any number of places. Later, we will be joining a local naturalist for an evening walk in the forest preserve. Dinner will be on your own with recommendation from us. We are back at our cosy lodge in the evening for tea and snacks before bed. This morning we are off to the Antisana Ecological Reserve a nationally preserved area. Here we’ll see have our first glimpse of the stunning Andes mountains. We’ll be on the lookout for wildlife including the spectacular condor, this protected area being home to some of the last of these giant birds. We’ll go with a trained guide who will be able to give us a real insight into the nature of special place. In the midst of this beautiful scenery, we will enjoy our own packed lunch on the trail today provided to us by our lodge. After our visit to the the park, we will travel the Quilotoa loop, known for its remote Andean villages and mountainous roads. We’ll take a break on our journey at one of the Haciendas in the town of Lasso for a break and a snack. We will end our day at our lodge with dinner together followed with stories told by the Ecuadorians, about the legends of the volcanos. We’ll have an early start on this day to catch the colorful Indian market in the town of Saquisili, where you can shop for locally made products. On the way we’ll talk about the the indigenous cultures that make the Andes their home. Then we’re on our way out the Lake Quilotoa, called by some as one of the most breathtakingly beautiful hikes in all of Ecuador. We’ll take our time enjoying our hike up and around the volcanic crater lake, with a picnic lunch on the way. Later, will stop at a local restaurant overlooking the volcano lake and you can reward yourself with a cocktail of your choice. Then we’re off to our cozy lodge located in the famous Quilotoa loop. We'll have dinner together tonight at an excellent restaurant known to the locals. Join us later at a local spot that offers Andean music for us to enjoy. This morning we’ll join our local guides on horseback as we explore the magical landscape of the cloud forest above Chucchilan. From the top of the ridge we’ll be able to see all the way to the coast of Ecuador. Lunch together as we eat our packed food on the trail. After we return from our ride, we’ll grab our packs (luggage) and head out for the region of San Andres. On the way we will have a stop in the city of Ambato, home to botanical gardens, which we will visit, and known for a special pastry which you may sample to your heart's content. We will end our day at a historic hacienda and enjoy dinner together in the dining room. After our breakfast, we’ll join local guides that will take us trekking to the high peaks of Chimborazo. Our guide will explain the volcano, flora and fauna in this high altitude wonderland. We’ll likely see llama, alpacas, and vicuñas in the wild on our way up. We’ll be packing a picnic lunch to enjoy during our stop at one of the shelters along with glorious views. Later we will come back to the hacienda for a change of clothes, necessary due to our change from higher altitude to warmer jungle forest. We will be off to Banos, the home of the Devil’s Cauldron Waterfall, a powerful waterfall formed by the crystalline Río Verde. We’ll also visit the Casa Arbol swings (you can literally swing into the clouds). Dinner on your own in Banos at recommended restaurants and then back to our lovely rooms at the Hacienda. Today is mostly set aside for travel. We’ll make our way from our Hacienda to the UNESCO World Heritage City of Cuenca. Along the way we’ll make some fascinating stops. We will peruse the various Sunday Market towns, visit Lago de Colta (a lake that is a birders delight), and stop at Ingapirca, (a town and site known for its Inca ruins). We will include other delightful surprises along the way. We will arrive in the late afternoon in Cuenca. After an introduction to the city, take your time to wander on your own in this city known for its 17th century era Spanish colonial architecture. Dinner is on our own with many choices of fine Ecuadorian or international food dining. We start our morning at the Cafe de Ñucallacta and introduction to Ecuador coffee. We will taste test and learn about what coffee means to the Ecuadorians in this region. Then the day is your choice of activities in and around Cuenca. You can have an option of a city tour, a tour to one of the towns surrounding Cuenca (for instance Panama hats are made close by), or you can visit Cajas National Park for spectacular hiking. Either way it is your choice and we will be on hand to facilitate. ​Later in the evening we will all meet back for dinner at a chef-driven restaurant in the this foodie capital of Ecuador. We are up early for our flight back to Quito. After being picked up at the airport we make our way to the Imbabura Province, one of the richest natural and cultural areas in Ecuador. After our exciting day we are on our way to a beautiful restored Hacienda. Our farewell dinner is tonight as we will relish all the things we experienced as we say goodbye to a great adventure. Hold A Place For Me! After breakfast we have one more fabulous activity before we say good bye- a visit to the Otavalo Market, simply one of the largest markets in South America. We’ll have local guides that will take us around the market so that we may see every facet before letting you on you own to wander and shop to your heart’s content. Rest your feet at the balcony restaurants for lunch overlooking the Plaza de Ponchos or grab a specialty coffee on the main church plaza. For those of you joining us on the Galapagos Island cruise we will gather and take our flight to the start of our adventure, stay overnight at a nearby hotel and then board our ship the next morning. For those of you returning to the states, be sure to book your flight for the following day. We wish you buen viaje, have a good trip! We will be at high altitude for a good portion of this trip. Quito, our starting city is at 2,850 m (9350 feet). You should be able to complete the following in order to enjoy yourself on this tour. 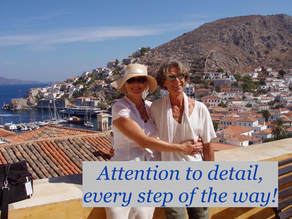 ​Be able to walk up a flight or two of stairs carrying your own luggage. Be able to hike a trail (at your leisure-to be sure it is not a race) at altitude. A deposit of $1000 holds a place on this tour. Spaces on this tour are on a first come, first serve basis. The remaining balance of $3990 (8 people and up) $3790 (10 people and up) and $3590 (12 people and up) is due May 31 2019. Up until that time all deposits are fully refundable. After final payment is received by The Olive Odysseys, no refund is available. Trip insurance should be purchased for this trip. Darwin Bay /Bachas Beach/ Snorkeling/ Prince Phillip's Steps / Galapagos land iguana/ Galapagos giant tortoises/ Birding/ Swimming crystal waters/ All meals on board/ +So much more! ​We board our catamaran this morning. We will unpack and have a meeting on board before enjoying lunch together. We will cruise to Bachas Beach for a guided walk and wildlife sightings. Later we will have time for snorkeling off the boat for underwater views. ​After Breakfast this morning we are off the the Prince Phillip's Steps for dry-land walking and our guided tour. We will be able to have time for deepwater snorkeling before lunch on board. Afterwards, we are off to Darwin Bay for a wetlands walk, for more wildlife sightings. If you would like in the afternoon there is an opportunity for snorkeling again for more spectacular underwater views. We will have a short talk from our guide before dinner together on board. ​This morning we will have plenty of time to explore Sullivan Bay and its wetlands. Swimming and snorkeling can be had before we reconvene on board for lunch together. Join us later are we visit the renowned Cerro Dragon, other wise known as Dragon Hill, home to the Conolophus subcristatus, or the Galapagos land iguana. Not too long ago these creatures were threatened by the islands' cat and dog population, but they have made a spectacular comeback thanks to conservation efforts. We will take our time exploring and you will also have time for more snorkeling. ​Dinner on board with plenty of time afterwards for relaxing and taking it easy. ​After a leisurely breakfast are off for the hike of the highlands of Santa Cruz. Here we will find lush verdant forests and the giant Galapagos tortoises, not to mention many birds. We will take our time before returning to the boat for lunch on board. In the afternoon we will have a guided tour of the breeding center set up for the conservation of the Galapagos giant tortoises. Join us later as our guide gives us a talk before our farewell dinner together. After dinner we will return to Quito, the capital of Ecuador. After breakfast this morning we say good bye to our Ecuador Adventure!